How to check the AIIMS MBBS 2019 Basic Registration status on aiimsrxams.org. 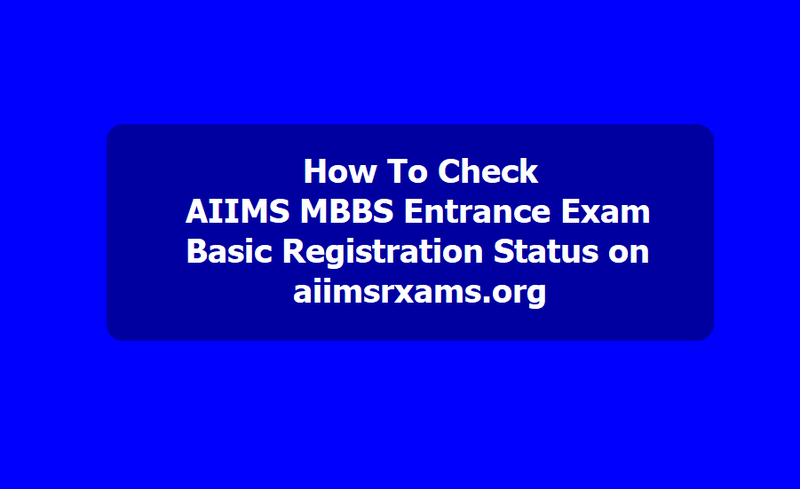 AIIMS MBBS Entrance Exam 2019 basic registration status uploaded: Steps to check the final registration and other details: AIIMS MBBS 2019 registration form status, Application form: The accepted candidates of Basic Registration will only be eligible to generate code for final registration based on which admit cards will be released. The final registrations will begin from February 21, 2019. The registrations will close on March 12, 2019. Re uploading of correct images: The All India Institute of Medical Science, (AIIMS), New Delhi in the candidates interest has extended the dates for re uploading of correct images in place of rejected images from 25th Jan. 2019 to 27th Jan. 2019 (up to 05:00 PM). There may be no further opportunity & hence all applicants are requested to use this facility. All concerned may please note that only successful candidates shall be eligible to complete other processes of Online Registration i.e. Generation of Code (for Final Registration) & Final Registration (for Payment of fees and city choice). Hence the uploaded images and Basic Registration should be in order in all respect.